Results from Baccarat Simulations Series 3 are presented below. In this series, I examined the methods RD12 and RD3. Read a discussion of the results in Squeaky Parts. Data Set: 102,600 baccarat shoes used, including Zumma 600, Zumma 1000, Wizard of Odds 1000, and Virtuoid 100,000 (ref. My Baccarat Shoe Factory). 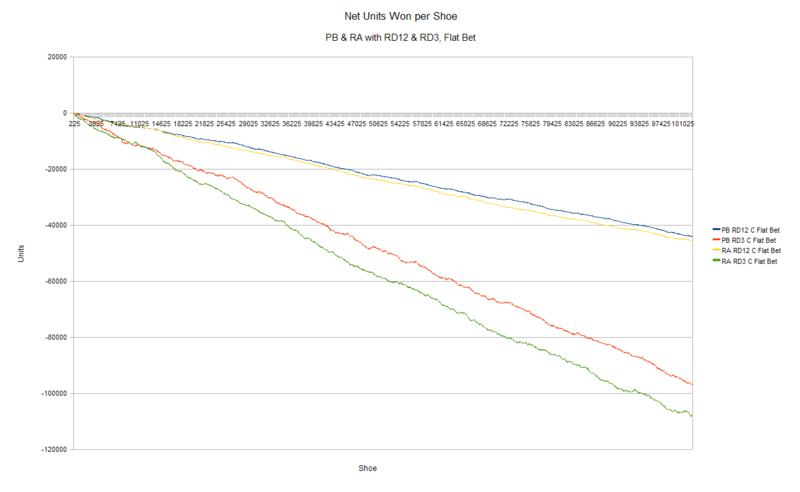 Player’s Advantage is the net units won after commissions divided by the total units bet. A, C refer to Money Management Procedures (ref. Money Matters). Flat betting and U1D2M2 betting progression (ref. Money Matters). % Shoes Won, Lost, Broke Even, and Best and Worst Scores are from shoes using U1D2M2. Disclaimer: The betting strategies and results presented are for educational and entertainment purposes only. Gambling involves substantial risks, and the odds are not in the players favor by design. The author does not state nor imply any system, method, or approach offers users any advantage, and he shall not be held liable under any circumstances for any losses whatsoever. This entry was posted on October 12, 2010 at 8:08 pm and is filed under Life with tags baccarat, baccarat simulations, baccarat simulator, banker, bet, bet progression, data, flat bet, flat betting, method, money, money management, player, RD, RD1, RD1 Hybrid, RD12, RD1H, RD3, Repeat Down, results, shoe, strategy, system, U1D2M2, Wizard of Odds, Zumma, Zumma 1000, Zumma 600. You can follow any responses to this entry through the RSS 2.0 feed. You can leave a response, or trackback from your own site.